Grand Bliss Nuevo Vallarta by Mayan in Nuevo Vallarta, Mexico! - Bid on a 4 Night Stay in a Grand Master Room! 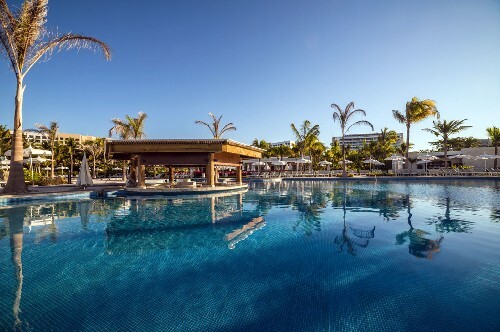 Enjoy 4 Nights at the Grand Bliss Nuevo Vallarta by Mayan in Nuevo Vallarta, Mexico! As of February 5, 2018, The resort charges a resort fee of $30 per person per day at check-in for all international travelers over the age of 12 and a $15 per person per day for all international travelers 2 to 12 years of age. Due to contract restrictions Mexican Residents are not permitted to use this offer. The Grand Bliss Resort enjoys a prime location within the complex in Nuevo Vallarta. From the balcony of the rooms, guests can enjoy the splendid views of the Sierra Madre and Banderas Bay, as well as admire the most beautiful sunsets in all of Mexico. And if you look carefully, you can see dolphins playing or whales jumping. The panoramic view of the golf course is a lush green. The Grand Bliss is located almost exactly in the center of the Nuevo Vallarta complex, a quick reference point for access to all activities and places. In addition, you can take pleasant walks ranging from the northern part where The Grand Mayan is to the southern part where the Mayan Palace and Grand Luxxe are, with all the services each offers. Experience the heady atmosphere of the Pacific Coast of Mexico, which distinguishes Nuevo Vallarta. Wrap yourself in the natural beauty of this community next to the sea, which gives more than 4 kilometers of unbeatable beaches and exuberant lush tropical gardens. Nuevo Vallarta is located just 15 minutes away from downtown Puerto Vallarta, where you will find a variety of shops, restaurants, bars and nightclubs. The spacious rooms at The Grand Bliss have the most elegant interiors that can be found in Mexico. Bright colors and fine wood tones will captivate you. Enjoy a Master Room with your family, which offers everything you might need during your vacation. If you require a larger room, you will be impressed with our Suite Room, which features a private pool on the terrace, where you can cool off pleasantly, and has been fitted with a fully equipped kitchen. The Following Check-in Dates are Available for a 4 Night Stay! Fee Includes: One-way transportation Airport to Hotel (contact concierge 72hrs before check-in), transportation throughout the Resort, local phone calls, basic Internet for 1 device, Gym Access, Press summary, a welcome drink and boarding passes/faxes printing. For Mexican residents contact Resort 01800/366-6600. This fee is additional and is not included in the offer price.